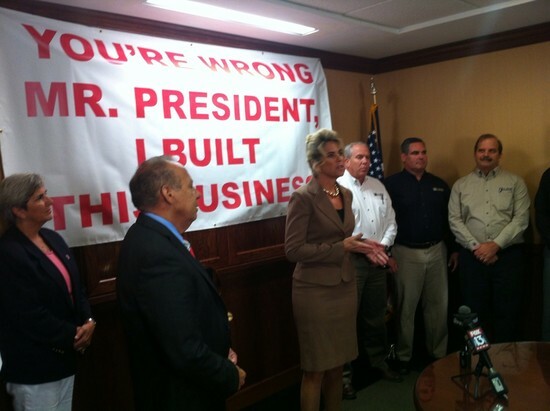 In events at small businesses in locations as varied as Waukesha, Wis. to Palm Beach, Fla. to Columbus, Ohio, entrepreneurs will express their anger at the “you didn’t build that, somebody else made that happen” line. Ramos is a 64 year old Hispanic veteran, serving in the military from 1973-97, including two tours at the Pentagon, and he said he did read and watch all of the president’s comments in context, not just the two sentences continually highlighted by the campaign. [Former Raleigh mayor and North Carolina GOP chairman Tom Fetzer] read the speech the President gave earlier this month in Roanoke, Virginia word for word during the event, to underscore they weren’t taking it out of context. “If you’ve been successful, you didn’t get there on your own,” he read. But it was the line, “If you’ve got a business, you didn’t build that, somebody else made that happen,” that offended so many Americans. “I didn’t take it out of context, I just, I think it was a jab. I don’t know why,” Snoopy’s co-owner Larry Cerilli said. This is, obviously, a good theme for Republicans. 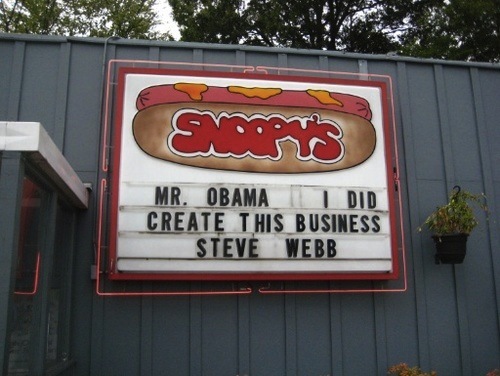 I’m sure the Obama campaign hopes it won’t have to produce too many more “I don’t hate small business” ads.